Hi Guys! Today I have some Essie polishes to show today. These are their new textured polishes filled with shimmers and glitters, called "Encrusted Treasures". I was super excited too finally purchase them. Belugaria - This is a beautiful jet black texture polish, filled with hexagonal glitters and matted circular black glitters. that look more like "debris". This is defiantly more a girly textured polish, with holographic glitters shimmering in the light. I prefer it without the top coat, but you can apply the top coat for more a glossy look. This is one coat, without top coat. Ignite the Night- This is one of my favorites. 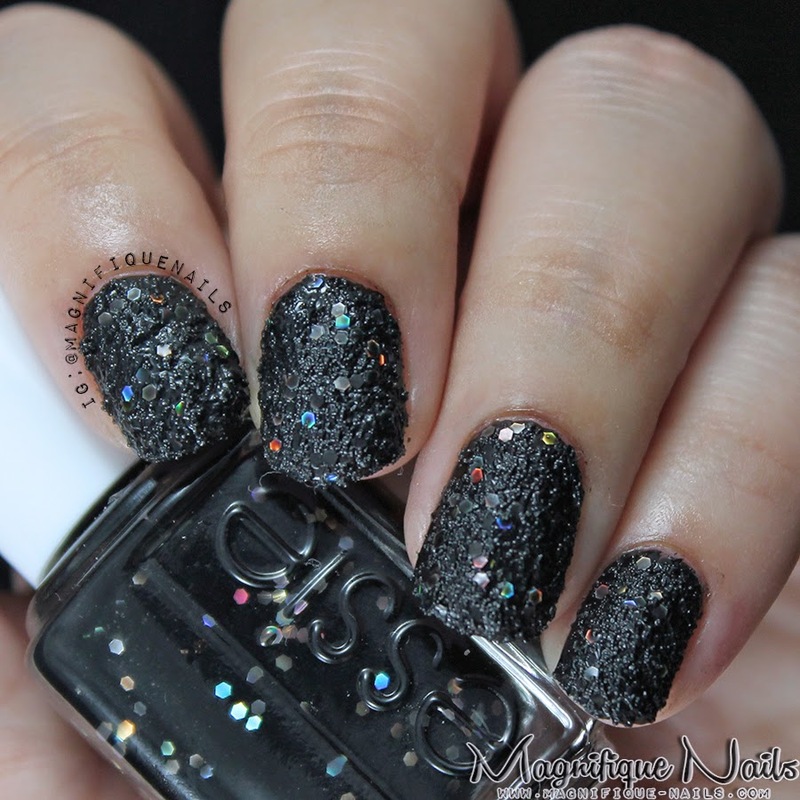 This is a stunning glitter polish that just sparkles. I felt I had jewels on my fingertips. It's filled with silver and brass micro glitter, with a matted finish. This is another textured polish, however, with top coat will give it a beautiful glossy sparkle look. This is one coat, without top coat. Hors d'Oeuvres - How can you not love this polish...it's sooo beautiful! My nails fell in love at first sight with amount of shimmer and glitters in this shade. It's not much of a texture polish like the others. However, it's beautifully filled with iridescent silver and gold shimmer and large sliver hexagon glitters. This is two coats, since it's a cleat base, without top coat. On a Silver Platter- They had me at the amount of glitters in this polish. This is a clear base, filled golden shimmers and holographic blue hexagon glitter, in various of sizes, with a matted finish. I can say this shade has some similarity's to Hors d'Oeuvres. This is two coats, without top coat. Peak of Chic- Not one of my favorite of the collection, but this more of a whimsical feathers. It's a clear base, filled with white and holographic micro bar glitters, that pop in the light. I prefer it over on top of a regular white clear polish, giving it a beautiful "white Christmas" look. This is two coats, over two coats of Essie's Blanc, with top coat. Lots of Lux- I just died! I love this shade and polish. This is defiantly my favorite polish of all, in the collection. 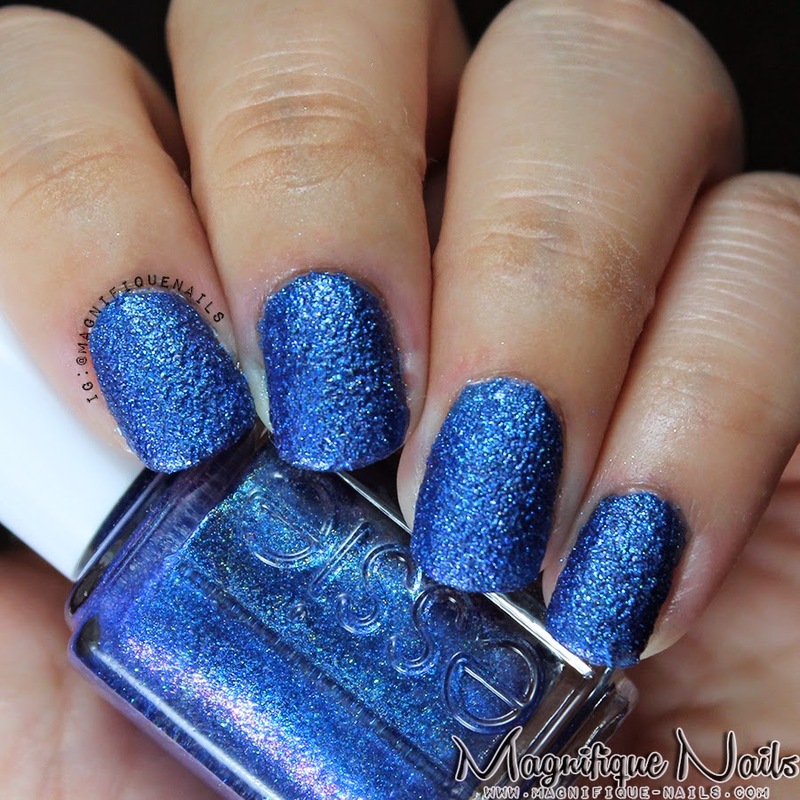 This is a textured polish, sapphire blue filled with blue, green, and gold glitters. The formula is a little thick, but it applies and dries perfectly. Love, love, love, what can I say! This is one coat, without top coat. Overall, the polish's are beautiful. Each with different textures and sparkle. Most of them you can apply top coat, for more a glossy finish. Definitely great for the holidays.